Western Digital is now shipping the new WD VelociRaptor 1 TB hard drive, the latest addition to its award-winning drive family, the largest capacity 10,000 RPM hard drive on the market today. Designed for high-performance PCs, Mac computers and professional workstations that require a balance of high performance and capacity, the WD VelociRaptor drive comes in capacities of 500 GB and 250 GB. The WD VelociRaptor 2.5-inch hard drive comes in the IcePack enclosure, a 3.5-inch mounting frame with built-in heat sink – a factory customization that fits the drive into a standard 3.5-inch system bay and keeps the powerful drive extra cool when installed in a high-performance desktop or workstation system. WD VelociRaptor’s outstanding read and write performance across the entire disk capacity make it a perfect match for the creative professional and enthusiast who want to optimize their tools, enhance productivity, and increase storage space at the same time. 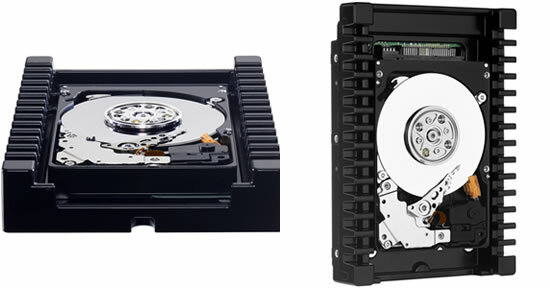 WD VelociRaptor hard drives come with a five-year limited warranty. Manufacturer’s Suggested Retail Price for the WD VelociRaptor 1 TB (model #: WD1000DHTZ) is $319.99 USD, the 500 GB version (model #: WD5000HHTZ) is $209.99 USD and the 250 GB version (model #: WD2500HHTZ) is $159.99 USD.